A North American sedan with European roots. Updated fascia gives the Buick Regal a look befitting its name. In 2013, GM sold more than 9.7 million vehicles worldwide for one of its best years ever. Its Buick brand contributed over 1 million sales, nearly matching Opel, and behind Chevrolet. China is the biggest market for Buick. In the United States, consumers who were once turned off by an assortment of aged sedans and nondescript utility vehicles from the tri-shield brand have now come around. Much credit for new consumer interest must be given to executives who understood that keeping and improving Buick and allowing higher volume Pontiac to die was the right choice. Today, most Buick and GMC outlets are tied together, giving car shoppers a wide range of vehicles. Buick along with Cadillac gives GM a 1-2 punch when reaching out to luxury and premium vehicle shoppers. Combined, the two brands captured more than 388,000 US sales in 2013, outpacing all other luxury brands. Certainly, a case could be made that Buick isn’t a luxury brand, but many of its offerings correspond to vehicles sold by Audi, Acura, Infiniti, and Lexus. Thus, Cadillac serves the higher end of the market and Buick the lower end. The Regal’s profile parallels the look of the Opel Insignia. One of the five models currently composing the Buick line is the Regal sedan. Introduced in 2011, the Regal is Buick’s version of the Insignia, an Opel model sold in Europe. Regal is a well-known Buick name, but the current iteration is not like any of the more recent Regals. Instead, it is a worthy reminder of earlier Regals including the Grand National particularly when the Regal GS is considered. And it was a 2014 Buick Regal GS in Crystal Red Tintcoat that was a recent press fleet loaner, a five-passenger sedan. Front-wheel drive is standard as tested, the GS was outfitted with optional all-wheel drive and powered by a 2.0-liter turbocharged engine mated to a six-speed automatic transmission. The powertrain combination and all-wheel drive give the Regal GS performance that rivals the Grand National and handling better than any Buick in my memory. You dont get paddle shifters with the GS, but you do have use of a manual gate though with no real shifting advantage. It would be great to have a manual gearbox available with the AWD, but it isnt available for now. The turbocharged four-cylinder is also used in the Cadillac ATS and makes 259 horsepower and 295 foot-pounds of torque. The turbo doesn’t kick in immediately, but when it does it takes this sedan from 0 to 60 mph in just over six seconds. Upgraded wheels and new tail lights were added for 2014. 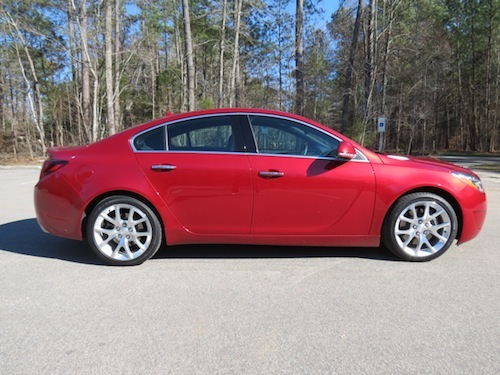 The Buick Regal GS is equipped with a Haldex all-wheel drive system, what sends as much as 95 percent of the engine power to the rear wheels when needed. Switching between standard, Sport and GS driving modes tweaks steering and the rear differential for improved handling. This model also has four-piston Brembo brakes up front as well as stiffer springs and adjustable shocks. The handling is quite good with very little torque steer present. 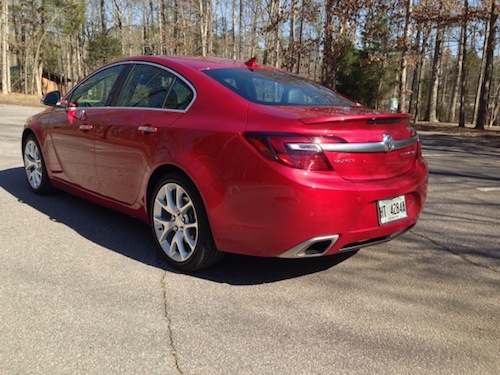 The 2014 edition also marks a mid cycle refresh for the middle of the three Buick sedans. Its good looks have been enhanced with wing-shaped LED lighting, the grille stretched out, and sportier high intensity headlamps added. Wing-shaped LED tail lights are the only change to the rear which continues with the lip-shaped spoiler and dual exhaust ports. This model sits on 19-inch alloy wheels and is outfitted with color-keyed, heated side mirrors. 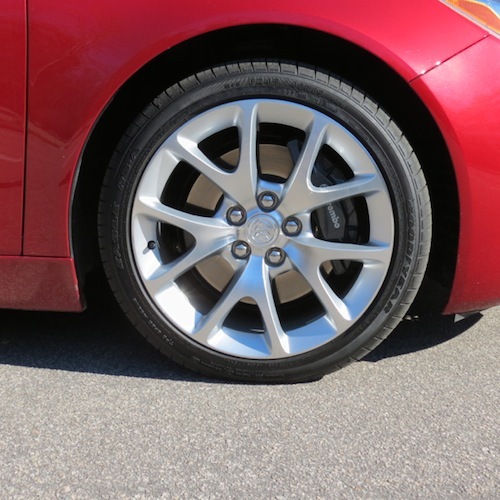 Buick Regal GS models get 19-inch wheels encased within Goodyear tires. 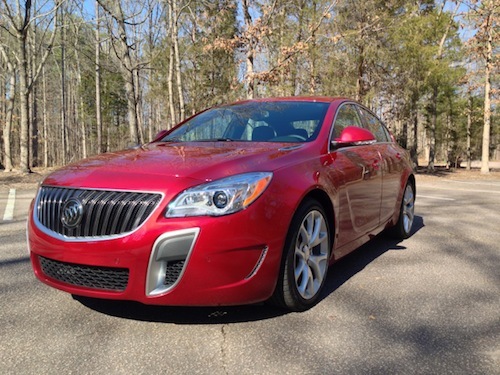 Buick equips the Regal with a remote vehicle start system and keyless entry. Push button start and a security system are standard. For 2014, the Regal GS receives an updated GMC Intellink infotainment screen, what now supports Stitcher SmartRadio and Pandora Internet radio. The front seats are plush and bolstered, and have a three-setting heating element. The top setting is quite warm, a good place to start on a frigid morning, but I found it uncomfortable after a while. The heating element on the tilt and telescoping steering wheel warms up fast the usual cruise and secondary controls are present there as well. I can’t say that the Regals interior has the wow factor you’d expect in this class. The design is stylish and modern, but the materials are average including simulated wood and bright work trim throughout the cabin. Soft touch materials across the dash are pleasant enough, but as tested this vehicle has a $44,275 sticker price. The 9-speaker Bose audio system befits the Regal or what rightly helps this model live up to its name. The next generation AWD Regal GS could use a manual gearbox. 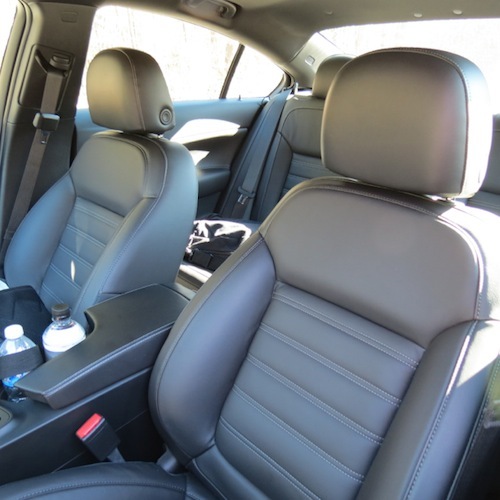 The rear seats are comfortable, but legroom is tighter than other vehicles in its class. Seat placement is for three, but you’ll find better room in the larger LaCrosse and comparable space in the smaller Verano. Trunk room is about average for its class as the spare tire is not included. Instead, you get one of those tire sealant and inflation kits that will have you calling roadside assistance instead. Tech features push up the price of any car and the Regal GS price reflects that. Ive grown to like the adaptive cruise control with GMs products and the ability to choose from three gap levels between cars. Automatic collision braking is also part of the package; both safety features bring the sedan to a full stop if you do not. Other safety features that drove up the price included lane departure warning, rear cross traffic alert, side blind zone alert, and lane change alert. The two safety packages added $2,500 to the base sticker price; another $1,000 was added with the power sunroof and $495 for the special paint finish. Supportive seats keep the front riders planted. The three Buick sedans are tightly positioned offering buyers a choice of small, medium and large models. The Regal may have the sleekest design of all three thanks to its Opel origins. Word has it that in two years when the next generation Regal debuts, Buick will have a lot more input on its design. Better quality cabin materials, more rear legroom, and upgraded powertrain choices would help this already attractive sedan move to the top of its segment. 2014 Buick Regal GS photos copyright Auto Trends Magazine. All rights reserved.